Welcome to Gourmetcubicle, the passion project of an engineer. The kitchen is my laboratory. This blog is intended to serve as a tool and inspiration for others who are passionate about food. Gourmetcubicle is for every day working people like me who want to play with a variety of cuisines while off the clock. I truly believe that the more you cook the more it will grow on you and the more confident you'll be in trying increasingly complicated dishes. Whether you're a tech nerd like me who wants to eat homemade meals and experiment with reproducing that amazing restaurant dish you ate, or a seasoned cook who wants to find inspiration for your next meal, you're in the right place. Hi, I'm Aurel (as in R-L) and I am the engineer behind gourmetcubicle. I am originally from Romania-- a place with a culture of hearty, home-cooked meals that runs deep-- but have spent many years living and traveling abroad. My cooking style is heavily influenced by Eastern European cuisine. My Romanian grandma taught me how to make amazing eggs in sour cream and a killer eggplant spread, while my Hungarian grandma taught me how to perfect the art of stuffed cabbage rolls and chicken paprikash. No restaurant could ever compete with my grandmothers' dishes, as their incomparable flavors came from a nowadays rare combination of fresh home-raised meats, colorful seasonal vegetables from the backyard, freshly-picked fruits from my grandfather's orchard, and fresh bread and dairy products from the old lady at the farmers market. While I inevitably had to turn in those days of lingering in my grandmother's kitchen for an adult life as a working professional, my passion for food and cooking never faded. I love food and this blog is my outlet for sharing that delight with you. I currently reside in Austin, Texas, where I cook for friends and family. 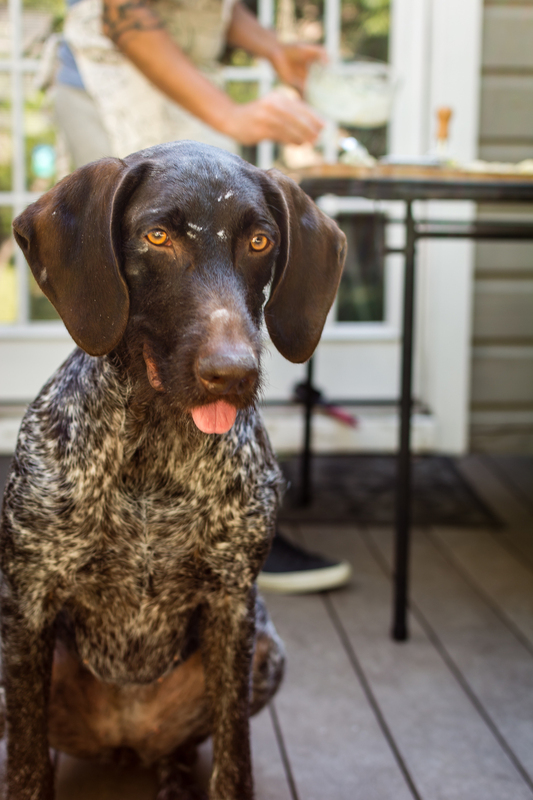 My sous chef is the silliest German Pointer in the world, a rescue dog named Popsi (@popsithedog). She is an excellent counter surfer and dishwasher, but her knife skills could use some work. I’ve always been attracted to photography, but never took the time to dive deeper into the art of taking pictures. Not long ago, I decided to start studying it like a good engineer would do, but quickly realized that I get lost in the details. In my first class, I spent over 2 hours geeking out over the Newtonian lens diagram. Needless to say, understanding that didn't do much to the quality of my pictures. Most often I use free online courses to improve my skills, but sometimes I just ask the right people. I'm using a Nikon 5200 Digital SLR camera with a 35mm f/1.8 prime lens. I recently acquired an 80mm macro lens as well. Still learning.